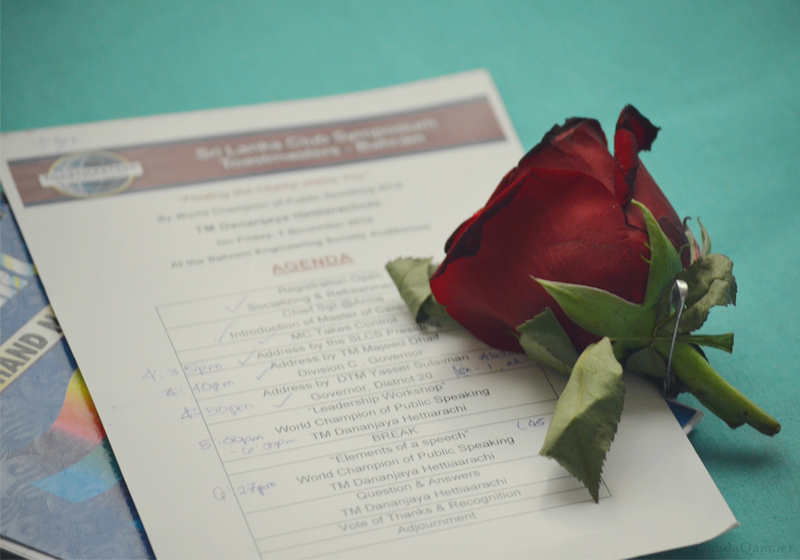 Last night I attended a toastmaster workshop by this years World Champion Public Speaker; Dananjaya Hettiarachchi. He spoke about really inspirational topics such as journeys, success, mentors, perseverance, believing, and gave us pretty good tips on delivering and writing a speech. After he won World Champion in Public Speaking, his winning speech got viral within the Toastmasters community in Bahrain. I mean, like, seriously, even my mom watched it and made everyone in the house watch it. If you haven't already, I suggest you watch it before you continue reading. The speech was pretty good. It was funny too, and his message "I see something in you, but I just don't know what it is" gives out quite the motivation and inspiration to the audience to see something in themselves and work towards attaining something great. But as time went on after the announcement that Dananjaya was coming to Bahrain to give workshop on speaking, his message "I see something in you..." was starting to get really annoying. No offense Dan, but people just continue to say it over and over and over again, trying to fit that sentence into everything they say, it just cooks up that annoying brew of a back slap to the person saying it. The entire workshop lasted about three hours. Dananjaya spoke for an hour straight, and we didn't even notice time pass. I thought he spoke for about 30 minutes or less, but I was surprised that he spoke for an hour straight with the audience on the edge of their seats. Congrats to him! But why this rose in the photos? I'll tell you. Being Vice President of Public Relations of my toastmaster club, Young Adult Toastmasters, I was spamming the clubs instagram, facebook, and twitter with photos and quotes during the workshop. And I'm not going to lie, I spent 30% of the time on my phone and just half listening to Dananjaya speak. 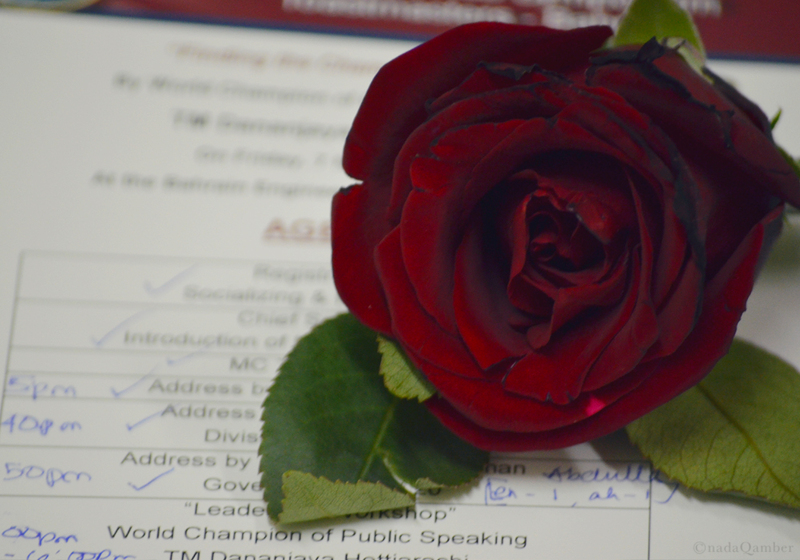 Towards the end of his session, Dananjaya, spoke his final inspirational words and of course his; what I now assume is his mantra, "I see something in you, but I just don't know what it is" He plucks the rose from the side pocket of his blazer, and throws it to the audience. I did not see this happening, because at the time I saw four notifications on my facebook that I decided to check out. So as facebook was loading, I suddenly hear a gasp from the audience and something red land on my lap. "what the hell? -.-" was what was going on in my head when I found the rose on my lap. What are the odds of having something thrown into the audience and having it land on a persons lap. HOW? People around me then started saying "Nada, you're going to get married soon!" "Nada it's a sign" "You're so lucky you got it"
And I just smiled, nodded and gave a little haha every now and then. Yay for a rose. But what's the sign? who am I getting married to? and why am I lucky?